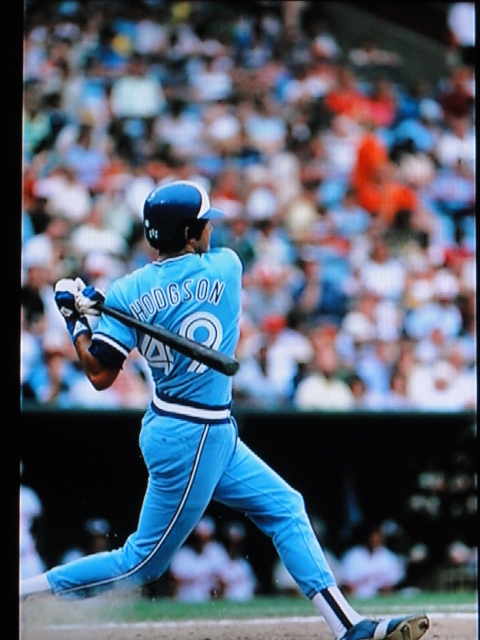 Marysville, N.B., native Paul Hodgson was the first right-handed hitting Canadian to homer for the Toronto Blue Jays. The Toronto Blue Jays are going all out to celebrate Canada’s birthday on Sunday. Players will don special red jerseys, there will be a street festival outside the Rogers Centre and the club will honour armed forces members and Olympians. This patriotic fervor makes me think of all of the Canadian players that have suited up for the Jays over the course of their 36-season existence.  Eighteen Canadians have played for the Jays: Dave McKay (Vancouver, B.C. ), Paul Hodgson (Marysville, N.B. ), Rob Ducey (Cambridge, Ont. ), Denis Boucher (Montreal, Que. ), Vince Horsman (Halifax, N.S. ), Rob Butler (Toronto, Ont. ), Paul Spoljaric (Kelowna, B.C. ), Paul Quantrill (Port Hope, Ont. ), Rich Butler (Toronto, Ont. ), Steve Sinclair (Victoria, B.C. ), Simon Pond (North Vancouver, B.C. ), Corey Koskie (Anola, Man. ), Matt Stairs (Saint John, N.B. ), Scott Richmond (North Vancouver, B.C. ), Shawn Hill (Georgetown, Ont. ), Adam Loewen (Surrey, B.C. ), Mark Teahen (Canadian citizen, St. Marys, Ont.) and Brett Lawrie (Langley, B.C.).  The first Canadian to suit up for the Jays was McKay, who played third base and recorded the game-winning RBI in the first game in franchise history on April 7, 1977.  The switch-hitting McKay is also the first Canuck to homer for the Jays. Batting left-handed, McKay belted his round-tripper off of Milwaukee Brewers reliever Eduardo Rodriguez in the seventh inning in a Jays’ 10-3 win on May 4, 1977.  The first right-handed batter to homer for the Jays was Marysville, N.B., native Paul Hodgson. Batting eighth and playing left field at Baltimore’s Memorial Stadium on September 19, 1980, Hodgson clubbed a sixth inning home run off of Orioles right-hander Dennis Martinez. Just two Canadian pitchers – Boucher and Hill – have toed the rubber for both the Montreal Expos and Toronto Blue Jays. Hill is the only hurler to record a win for both Canadian teams.  Four Canadians – Boucher, Hill, Stairs and Ducey – have suited up for both the Montreal Expos and the Toronto Blue Jays in a regular season game. Hodgson went to spring training with the Expos in 1985.  Stairs hit 32 home runs for the Jays in 2007 and 2008, that’s the most by a Canadian for the club. Lawrie is already in second place with 16 four-baggers.  Two “Pauls” – Paul Quantrill and Paul Spoljaric – were the first two Canadians to be on a Blue Jays roster together on Canada Day. They were with the Jays in 1996. With Brett Lawrie (Langley, B.C.) and Scott Richmond (North Vancouver, B.C.) on the roster, this will be second Canada Day that there will be two Canucks on the team.  Those same two “Pauls” are also the only Canadians that have pitched for the Jays on Canada Day. Quantrill made relief appearances in 1997, 1998 and 2001, while Spoljaric came out of the bullpen in 1996 and 1999.  No Canadian has ever homered for the Jays on Canada Day. Stairs was a combined three for six (three singles) in Canada Day contests in 2007 and 2008. Thanks. Had to revise it because I made an error. Paul Quantrill and Paul Spoljaric were the first two Canadians to appear on a Blue Jays roster together on Canada Day not Lawrie and Richmond. It’s amazing to see the achievements of Canadians in Pro Ball. On another note, I chuckled at the inductee who mentioned that Celine Dion sang the national anthem at Expos games. I never knew that. Another Canadian and current Jay Brett Lawrie seems is becoming a huge fan favourite in Toronto. I saw some young ladies with a message for him on a banner during today’s game. He must have been inspired as he promptly hit a home run to left field. You were right about Lawrie when he came over last year Kevin! I can almost feel some interest brewing in TO over this year’s edition of the Jays. Good for them. I’d love to see them back in the playoffs. There are many hard working players and coaches on this team. A trip to the playoffs would do wonders for baseball in Canada! Thanks for your comment, David. I took some flak over saying that Brett Lawrie has a chance to become the most popular player in Blue Jays’ history last year. But I still believe that. I’m not saying he’ll be best player in Jays’ history, but the most popular. And I agree, It would be nice to see the Jays in the playoffs again. Kevin, last year when I saw your quote I didn’t read it thoroughly and I misunderstood it. I know you didn’t say Lawrie would be the best player in Jays’ history. Although he is very good and very entertaining. You may very well be right about his popularity. After you made that comment I followed his play closely, last year and this year. He seems to play with tenacity regardless of what the score is or who the Jays are playing. Tigers manager recently lamented the lack of tenacity in his team laden with heavily paid superstars. He noted an unwillingness to do anything to win in some players. He said that he needed “more dirtballs on his team.” That was the quote and he defined dirtballs as players who do all the little things, even if they get dirty or don’t get noticed in the stats. The fans in Toronto have noticed that Lawrie is willing to do anything to win and they are responding as you said they would. One can only hope this attitude is infectious in the Jays’ clubhouse. You need to create a Canadian trivia book. Great facts, feats and firsts. Thanks, Devon. That’s kind of you to say.